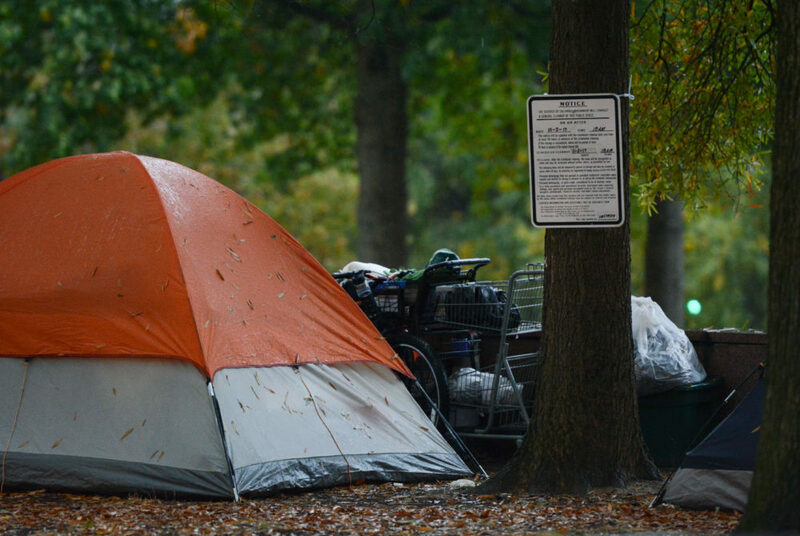 As of Friday, the homeless encampment on E Street – set to be removed this week – consisted of 12 tents pitched in the park. For sophomore Aaron Snyder, the planned removal of a homeless encampment on E Street Thursday is personal. Snyder, the co-president of People in Crisis, a New Jersey-based group that assists communities in need, has worked with the encampment’s residents for almost a year to lower their medication costs. Snyder said he was outraged by the District’s plans to clear the camp, located across the street from the former Red Cross building, because it will push members of the community out of the area without anywhere to go. Snyder said his group and members of the Jewish Student Association are preparing to speak to the mayor’s office after the planned removal to make sure that city officials provide the displaced people with at least a temporary place to live. He said if the office refuses a meeting, the group will protest at the office and reach out to other homelessness advocacy groups in the city. Sean Barry, the communications director for the Office of the Deputy Mayor for Health and Human Services, said the encampment is being cleared because of health concerns about the camp’s residents and surrounding neighbors. Encampments attract rodents and lack important resources like running water, he said. “It is neither healthy nor sustainable for individuals or groups of people to live in camps without running water, sanitation or waste facilities or other essential needs,” Barry said in an email. He said city officials gave verbal warning to the camp’s residents and posted signs on trees near the encampment two weeks before the planned removal. When completing dispersals, he said the Department of Human Services and Department of Behavioral Health helps connect people experiencing homelessness with housing, shelters and health services. Barry said E Street has been a part of “regular encampment response efforts” but declined to say how many times the encampment had been cleared in the past. Once the area is cleaned, it may be recleaned without any further notice, according to the sign posted at the encampment. As of Friday, the camp consisted of 12 tents pitched in the park. Jonathan West and his wife Maisha Stone, who live in the E Street encampment, said they have faced multiple dispersals from areas around E Street causing them to relocate to several different sites in the area. West said he is concerned about being forced to move long distances because the two have health conditions that make carrying their possessions a challenge. Stone said the couple has their names on the housing list and cannot move far away from their doctors. Snyder said People in Crisis tries to help residents of the E Street encampment, as well as other communities with limited health coverage in Philadelphia and New Jersey, get products and services they need to survive and improve their situation, like food, medical assistance, homelessness advocates and housing. Through partnering with companies like Novo Nordisk, People in Crisis plans to connect its clients to voucher programs that reduce the price of services, he said. Snyder brought the organization to D.C. last year after meeting the founder and co-president Lana Samuels while speaking with a man who was homeless at a bus terminal in Atlantic City, N.J.
Like Snyder, about eight students from the Jewish Student Association have also been working with the homeless community on E Street, handing out food every Friday. The group is also planning to host a forum to discuss homelessness in the area and wants to speak to city officials to voice their opposition to the encampment’s removal. D.C.’s homeless population dropped to 7,473 this year, but the average wait time for families in need of subsidized housing was 39 years for a studio apartment in 2013, a wait that could force families into shelters or onto the streets, according to The Washington Post. Last February, D.C. sanitation employees dispersed an encampment by the Whitehurst Freeway to clean the area over waste concerns. Henry Berg-Brousseau, a sophomore and a member of JSA, said he hopes to continue to support the E Street encampment by giving its residents food and backing their rights. He is scheduling a protest, along with other student advocates, on the day of the evacuation.